In this study, two different salting methods (dry salting and salted in scalding water) and also application of potassium sorbate to prevent mold growth (in 5% concentration for 2 minutes immersion method) were investigated effects on quality properties of Kashar cheese. Kashar cheese samples were ripened at 4 ±1ºC for 5th, 30th, 60th, 90th days and ripening parameters compared during ripening periods. According to the microbiological analysis results, total aerobic meshophylic bacteria (TAMB), lactic acid bacteria (LAB) growth on MRS and M-17 agar and mould counts of Kashar cheeses were found statistically different among all samples (P<0.01). The highest mold count (3.58 log cfu/g) was found at control samples salted in scalding water. The lowest count (1.48 log cfu/g) was found at sorbated samples salted as dry. The mould counts of the Kashar cheese samples treated with potassium sorbate were under of standart level (maximum 2 log cfu/g). But, sorbate was not completely prevent mold growth. Coliform group bacteria counts were determined <1 log cfu/g and S. aureus counts were determined <2 log cfu/g at all samples. It was found that acidity values increased in all Kashar cheese samples during the ripening periods. Acidity values of all control groups were higher than that of sorbated samples. The WSN, TCA-TN, PTA-TN and RI values increased in all Kashar cheeses during ripening periods. According to the sensory analysis results, it was determined that there was no adverse effect of sorbate on the sensorial quality of samples during all ripening periods. Panelists preferred the samples salted in scalding water than that of dry salted samples. Akbulut, N., Gonc, S., Kınık, O., Uysal, H., Akalın, S., Kavas, G. (1996). Bazı Tuzlama Yöntemlerinin Beyaz Peynir Üretiminde Uygulanabilirliği ve Peynir Kalitesine Etkileri Üzerinde Bir Araştırma 1- Duyusal ve Mikrobiyolojik Özelliklere Etkileri. Erzincan Üniversitesi Fen Bilimleri Dergisi, 33(1), 9-15. Altuğ, T. (1993). Duyusal test Teknikleri. E.U. Mühendislik Fakültesi Ders Kitapları, İzmir Yayın No: 28. Anonymous (2013). Turkish Food Codex Regulations on Food Additives. Ankara, Turkey. Arıtaşı, C. (1990). Çeşitli Kuru Meyvelerin İlavesi ile Üretilen Vakumla Ambalajlanmış Kaşar Peynirlerinin Özellikleri Üzerine Bir Araştırma. Ph.D. Thesis, Trakya University Edirne, Turkey. Aworh, O.C., Egounlety, M. (1985). Preservation of West African soft cheese by chemical treatment. Journal of Dairy Research, 52, 187-193. Çürük, M. (2006). Influence of Themelting Salts Used on the Some Characteristics and Ripening Properties of Kashar Like Cheese. PhD. Thesis, Department of Food Engineering Institute of Naturel and Applied Sciences University of Çukurova, Konya, Turkey. Famá, L., Flores, S.K., Gerschenson, L., Goyanes, S. (2006). Physical characterization of cassava starch biofilms with special reference to dynamic mechanical properties at low temperatures. Carbohydrate Polymers, 66(1), 8-15. Fox, P.F. (1989). Proteolysis during cheese manufacture and ripening. Journal of Dairy Science, 72(6), 1379-1400. Gül, O., Dervişoğlu, M. (2013). Investigation of sodium benzoate and potassium sorbate content and evaluation of microbiological parameters of fresh Kashar cheeses. Korean Journal for Food Science of Animal Resources, 33(4), 549-554. Güler, Z. (2005). Quantification of free fatty acids and flavor characteristics of Kasar cheeses. Journal of Food Lipids, 12, 209-221. Güven, M., Karaca O.B. (2001). Proteolysis levels of White cheeses salted and ripened in brines prepared from various salts. International Journal of Dairy Technology, 54(1), 29-33. Güven, M., Karaca, O.B., Kaçar, A., Hayaloğlu, A.A., Çürük, M. (2003). Kaşar peynirlerinin proteoliz düzeyleri üzerine farklı ambalaj materyali ve olgunlaşma süresinin etkileri. GAP III. Tarım Kongresi, Şanlıurfa. Jarret, W.D., Aston, J.W., Dulley, J.R. (1982). A simple method for estimating free amino acids in Cheddar cheese. Australian Journal of Dairy Technology, 37, 55-58. Koçak, C., Ersen, N., Aydınoğlu, G., Uslu, K. (1998). Ankara piyasasında satılan Kaşar peynirlerinin proteoliz düzeyi üzerinde bir araştırma. Gıda, 23, 247-251. Koçak, C., Bitlis, A., Gürsel, A., Avşar, Y.K. (1996). Effect of added fungal lipase on the ripening of Kashar cheese. Milchwissenschaft, 51(1), 13-17. Kristo, E., Koutsoumanis, K.P., Biliaderis, C.G. (2008). Thermal, mechanical and water vapor barrier properties of sodium caseinate films containing antimicrobials and their inhibitory action on Listeria monocytogenes. Food Hydrocolloids, 22(3), 373-386. Kurt, A., Çakmakçı, S., Çağlar, A. (2007). A Guide Book of Analysis Methods of Milk and Milk Products. Turkey: Ataturk University, Agriculture Faculty, Erzurum, Turkey. Lau, K.Y., Barbano, D.M., Rasmusen, R.R. (1991). Influence of pasteurization of milk on protein breakdown in Cheddar cheese during aging. Journal Dairy Science, 74(3), 727-740. McSweeney, P.L.H., Fox, P.F. (1997). Chemical methods for the characterization of proteolysis in cheese during ripening. Lait, 77, 41-76. Özdemir, C., Demirci, M. (2006). Selected microbiological properties of Kashar cheese samples preserved with potassium sorbate. International Journal of Food Properties, 9, 515-521. Payne, M.R., Morison, K.R. (1999). A multi-component approach to salt and water diffusion in cheese. Interantional Dairy Journal, 9, 887-894. Piacquadio, P., De Stefano G., Sciancalepore, V. (2001). A no brine method for Mozzarella cheese making. Milchwissenschaft, 56(4), 204-206. Polychroniadou, A., Michaelidou, A., Paschaloudis, N. (1999). Effect of time, temperature and extraction method on the trichloroacetic acid-soluble nitrogen of cheese. International Dairy Journal, 9, 559-568. Say, D. (2008). Effects of salt concentratıon of scalding solution and storage period on properties of Kaşar cheese, Ph.D. Thesis, Çukurova University, Adana, Turkey. Sert, D., Ayar, A., Akın, N. (2007). The effects of starter culture on chemical composition, microbiological and sensory characteristics of Turkish Kasar cheese during ripening. International Journal of Dairy Technology, 4(60), 245-252. Tarakçı, Z., Küçüköner, E. (2006). 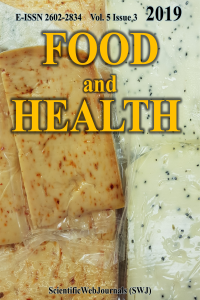 Changes on physicochemical, lipolysis and proteolysis of vacuum-packed Turkish Kashar cheese during ripening. Journal Central Europen Agriculture, 7(3), 459-464. TSE (2006). Kashar Cheese Standard (TS 3272). Ankara, Turkey: Turkish Standard Institute. Türe, H., Gällstedt, M., Hedenqvist, M. S. (2012). Antimicrobial compression-moulded wheat gluten films containing potassium sorbate. Food Research International, 45(1), 109-115. Uzun, Y.S. (2006). A study on viability of Lactobacillus acidophilus LA-5 and Bifidobacterium bifidum BB-12 againts scalding and dry salting during Kaşar cheese making. M.Sc. Thesis,, Harran University, Şanlıurfa, Turkey. Üçüncü, M. (1980). Peynircilikte sorbik asit ve kullanım olanakları. Gıda, 5(4), 79-87. Yalman, M., Güneşer, O., Yüceer, Y.K. (2017). Evaluation of Some Physical, Chemical and Sensory Properties of Kasar Cheese and Its Processed and Analogue Types. Tarım Bilimleri Dergisi, 23(1), 63-75. Yangılar, F., Oğuzhan Yıldız, P. (2016). Casein/natamycin edible films efficiency for controlling mould growth and on microbiological, chemical and sensory properties during the ripening of Kashar cheese. Journal of the Science of Food and Agriculture, 96(7), 2328-2336. Yılmaz, F., Dağdemir, E. (2012). The effects of beeswax coating on quality of Kashar cheese during ripening. International Journal of Food Science and Technology, 47, 2582-2589.